Lots of different influences seen in the works of Araya. Fuseli, Bocklin, Schiele, Klimt, Bosch, Redon, Beksinski. I’m not meaning to name drop at all here. These are artists I really recognize in his work, which really promotes fantasy art (done for heavy metal and science fiction covers among other things), to a higher level. Here you might see influences of Klimt, Schiele, and Art Nouveau in general. 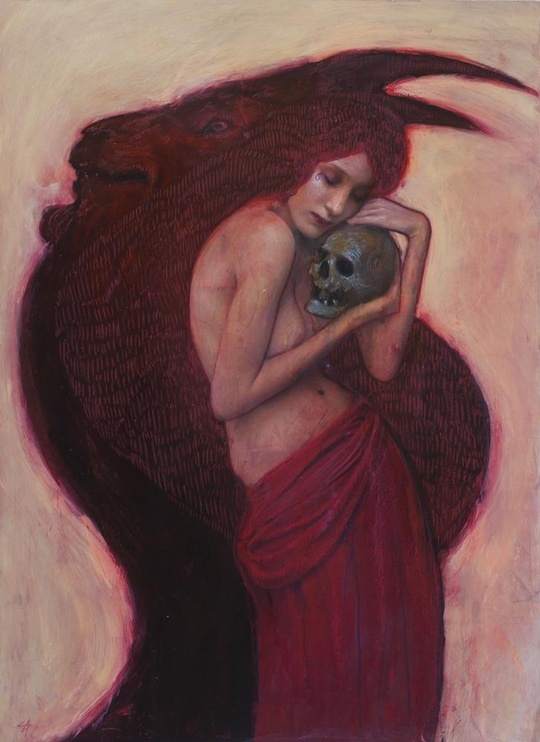 This entry was posted in art, Art Nouveau, fantasy, Gothic art and tagged art, Art Nouveau, decadence, fantasy, gothic, Klimt, Samuel Araya, Schiele. Bookmark the permalink. Is the animal a goat or a ram? As with his other work, time shoud be spent studying it.